Mary was my mother and my mentor. This rabbit pie is a family heirloom, cooked wherever and whenever my family meets. My mother would have used any rabbit caught by my grandpa, and the pie would have had more or less meat in it accordingly – so a wild rabbit of any size will do here. Remove kidneys and liver from rabbit and reserve. Simmer rabbit in stock with celery, carrot, onion, zest, herbs and peppercorns until back legs test tender, 1–2 hours. Allow rabbit to cool completely in stock. Remove rabbit and set strained cooking liquid aside. Strip all meat from carcass and cut into small pieces. Discard bones. Heat oil and lightly sauté bacon and mushrooms, then quickly sear reserved kidneys and liver. Chop kidneys and liver and mix with rabbit meat, bacon, mushrooms and almonds in a bowl. Mix in parsley and season well. Cover with plastic film. To make the sauce, cook butter and flour over a gentle heat to make a roux[*]. Gradually stir in reserved rabbit stock and bring to simmering point. Add cream and lemon juice and simmer for 10 minutes, using a simmer mat to prevent sauce sticking. Check for seasoning, then add enough sauce to meat to make a creamy, not sloppy, filling. Allow to cool completely. Preheat oven to 200°C. Line a 28 cm x 18 cm x 3 cm lamington tin with pastry (reserve some pastry to make a latticed top) and bake blind [*] for 20 minutes. Remove pastry case from oven and allow to cool. Reduce oven temperature to 180°C. Spoon filling into pastry case (it will be easier to cut squares or wedges if filling is a maximum of 4 cm deep). 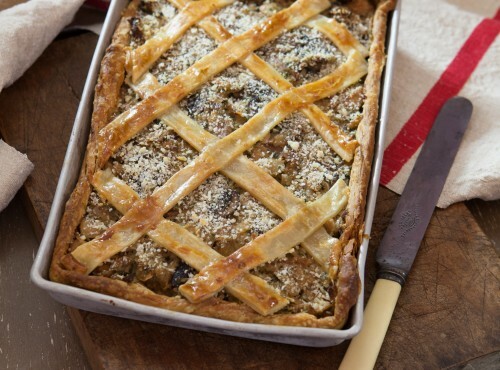 Scatter top with breadcrumbs and criss-cross strips of pastry over filling. Bake for 15–20 minutes until pastry is well browned. Serve warm or cold with mustard, chutney or pickled fruit. poaching This method of simmering a rabbit in stock can be used if wanting meat for sandwiches or whenever a filling is required.